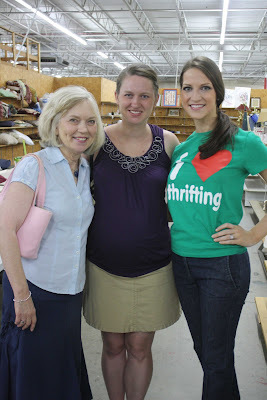 dwell and tell: I Love Thrifting Day in Alabama - 2012 Recap! 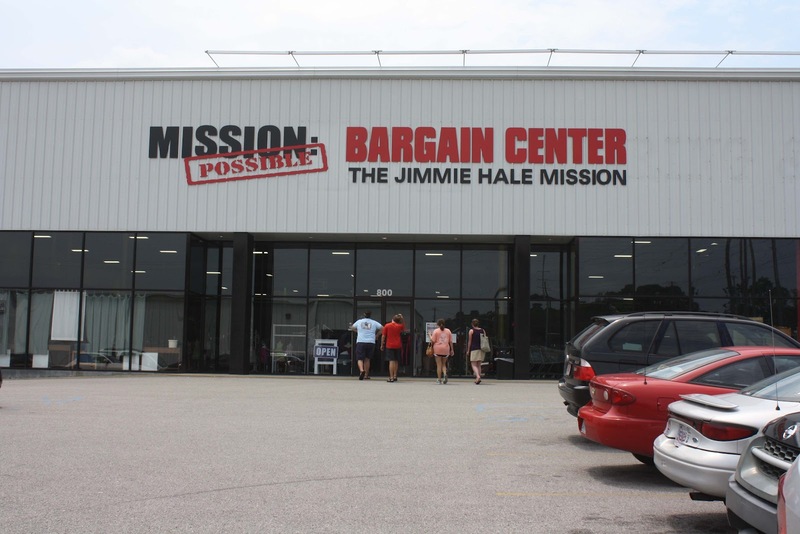 I was proud to host a party for Alabama to be represented in this national "event" on Saturday! 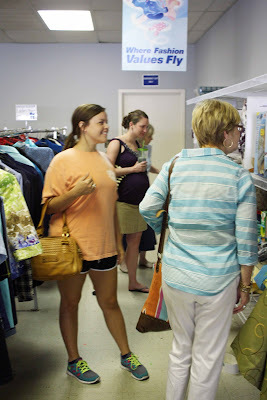 I Love Thrifting Day was the brain-child of Mr. Goodwill Hunting, Rashon Carraway. Rashon is an incredibly talented blogger and has even been featured several times on the Nate Berkus Show! His segments are hands-down some of my favorites on the show. I know there were several of you who wanted to come out but were on vacation as it was the week of Independence Day, but we still had a nice turn-out and had so much fun! Ready for a recap? 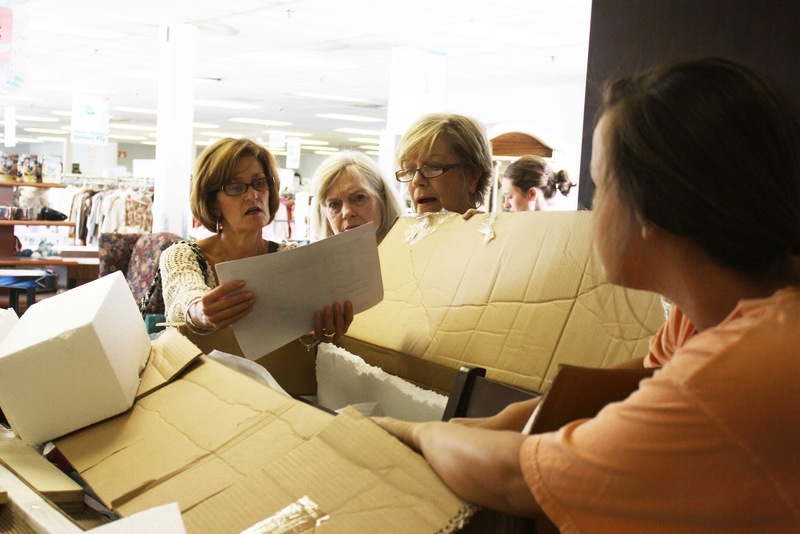 We started out at Goodwill in Homewood, Alabama in the morning. 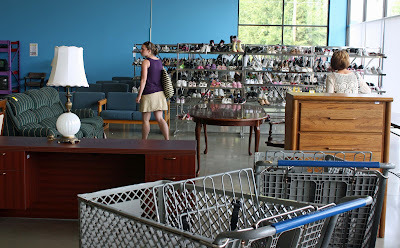 One of my favorite thrift stores! 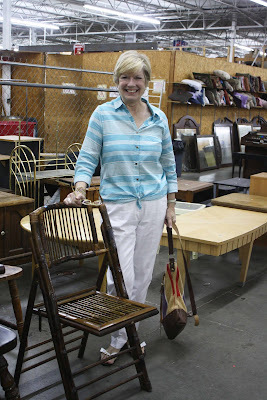 My awesome mother-in-law has incredible taste, and found this adorable bamboo chair for $15. It folds up for easy storage, so she's going to use this when she has extra guests and has the option to store it in a closet if she wants. 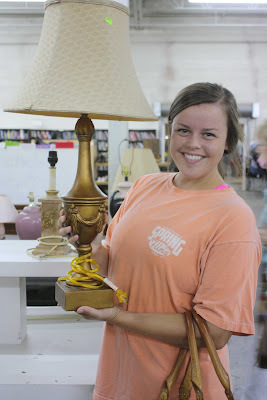 I spotted this lamp and it looked just like something my friend Lindsay would like. She scooped it up for $3.09! We're planning to paint it a fun color for her kitchen! It was so good to see Susie again, who I met last year. She is 9 months pregnant but still came out in this heat to enjoy the day with us! We found this brand-new kitchen table and chairs for $125 (originally from Target). As you can see below, everyone pitched in to help Lindsay decide if it was right for her. What great team-work (a real advantage of I Love Thrifting Day!). 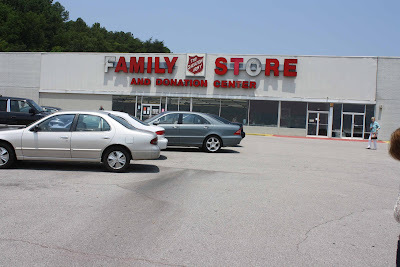 Next, we headed right down the street to the Salvation Army Thrift Store in Homewood. It's less than 1/2-mile down the road so it was an easy choice to make. 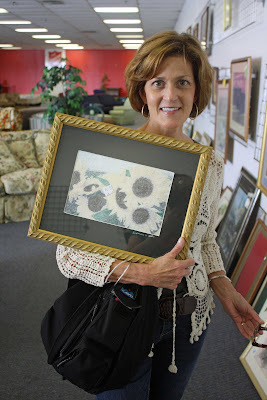 :) Also, my mom scored some jaw-dropping pieces during I Love Thrifting Day last year. So why not try it for our event again? 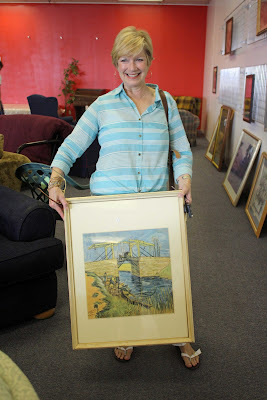 Another great art find from my Mom! And a little piece that Lindsay decided to pass up... :) It's nice to take time to apprecite the random objects found only here. 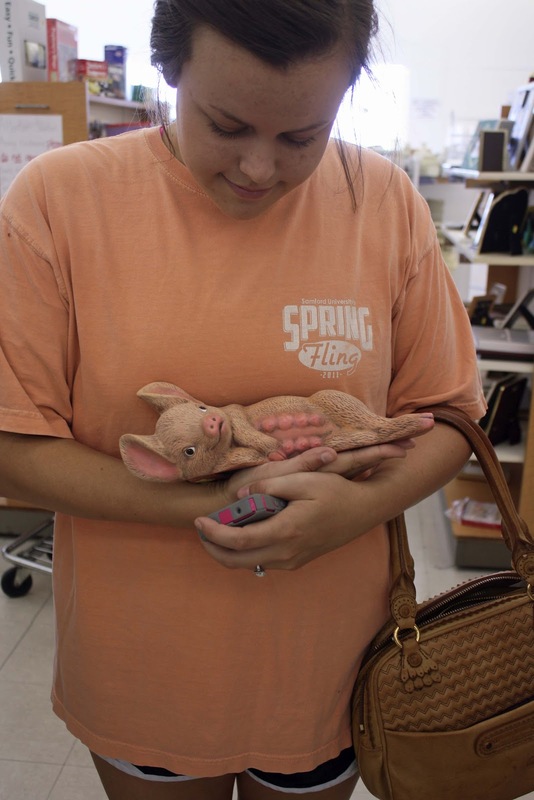 Like a ceramic pig with eight huge, suckling teats. We found some other great things too... a Christmas cookie dish (super-classy), a kleenex cover (again, super-classy), and Susie's mom found some preeeeecious clothes for her toddler grand-son. I should have gotten some photos of those. Nexxxttt.... MEXICAN FOOD! We had a fun lunch at a local place right down the road. 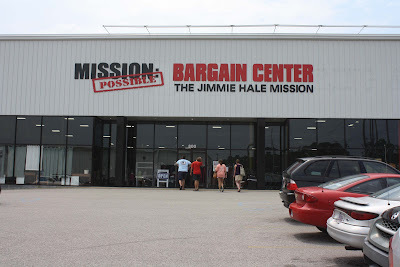 Then we headed to Mission Possible Bargain Center in Homewood. It's so wonderful how close these places are to each other. Lindsay's fiance and brother joined us here. The more the merrier! Look what I found! 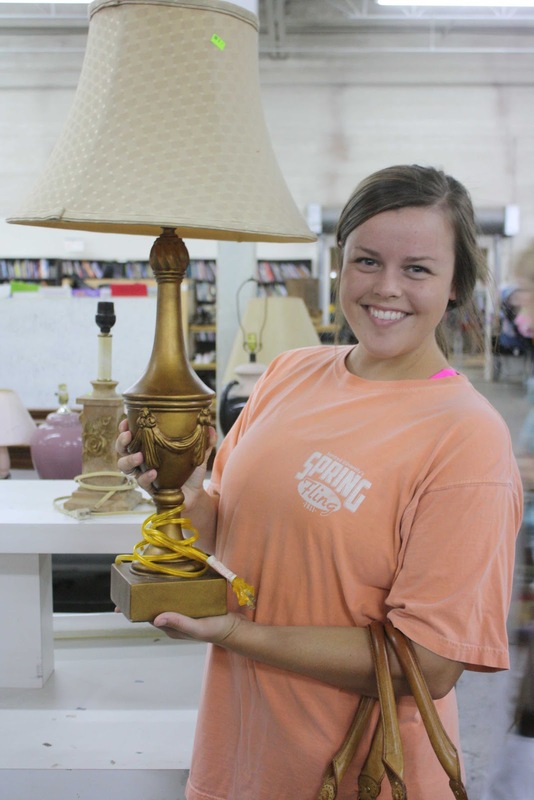 I kinda-kitschy little lamp with a map lamp-shade for $4.99. The base is peeling paint and the map is even peeling off the sade, but with some help it could fit perfectly in our guest bedroom/office (details on that coming soon). Such a great party. 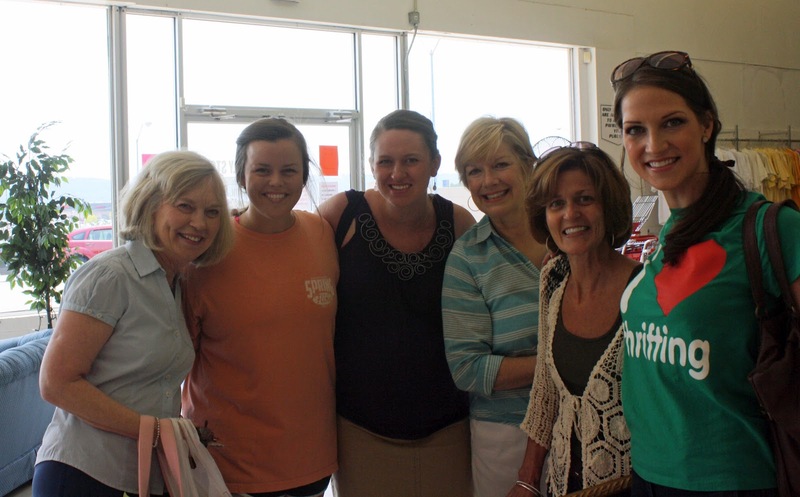 We had a great I Love Thrifting Day in Birmingham, Alabama! My favorite things about the day. - Shopping with sweet people that have similar interests, and amazing personalities. - Learning from the group. And finding more! One of my favorite things about I Love Thrifting Day is that you seem to find more because you have everyone keeping their eyes peeled for a piece with potential.They might spot something, but it's not right for them. So they make sure someone else leaves with the deal! 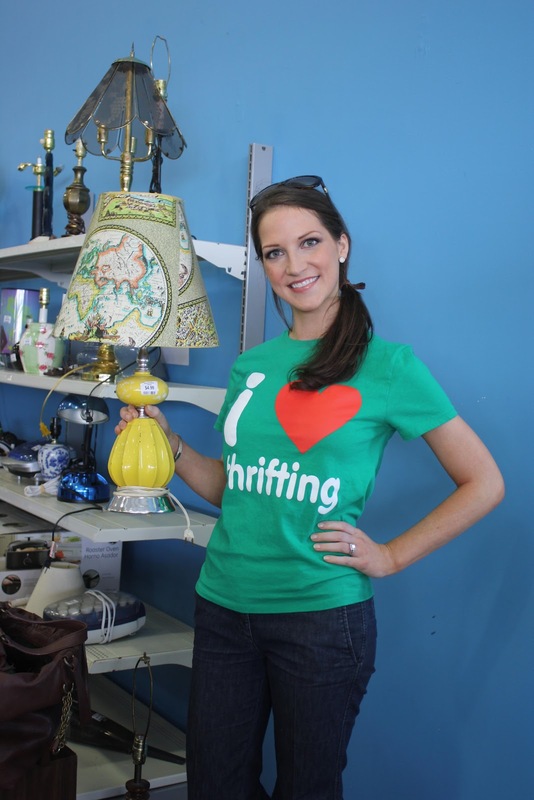 Remember to follow the recaps on your social networks with the hashtag #ilovethrifting. Find anything recently on a trip to the thrift store or a yard sale? 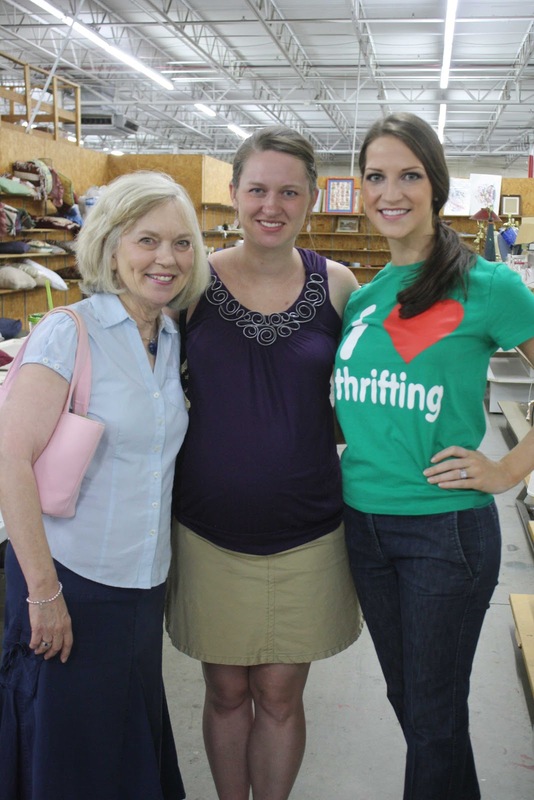 Did you participate in I Love Thrifting Day in any part of the country? In Alabama? I want to hear from you! Thanks again for hosting, I had a great time and it was so fun to see you again! Baby came just a few days later on Wednesday morning :) Will blog soon! i am throughout this post to support you with the majority of your short conservative wishes. The $64000 day development art a formidable item and administrations that has the potential makes it gettable for fewer than title loans montgomery reasonably men and women, as you, normal! Whenever crises happen, don't anxiety! Happen see folks. Were genuinely, there on the commercial center for you one in every of U.S.A. assume seriously with relation to supporting anybody with the majority of your scotch wishes.